Today's post is about the reason I started quilting, again going in reverse order of the quilts I have made so far. This is the fourth one I finished. I had a TON of t-shirts from high school/middle school that were just sitting in my drawers, taking up space. I heard about the ingenious idea to make them into a quilt - but how? I did some research online and found out that for the amount of shirts I had, I would easily have to pay 500 dollars for a quilt. Psht. I don't have that kind of money, and I had a whole boring summer ahead of me. What to do? I had taken a basic sewing class in sophomore year of high school (which at this point means... almost five years ago... wow). I remembered very little. All I knew was that I wanted to try sewing. So, yes, I originally started with another quilt. But I started this one early on and finished it later. It was a monster, let me tell you. I borrowed my (now soon-to-be mother in law's) old sewing machine to see what I could do. I self-taught myself EVERYTHING, from the internet and from the machine handbook (and I'm definitely still learning - there's lots of things I can improve/add - but isn't it the same with every quilter? :) ). I was actually pleasantly surprised at how easy it was to remember how to use the machine, etc. Like I said, this quilt turned out to be a monster. I literally did not finish quilting it because a) it was so big and I'm not quite as proficient with big quilts yet and b) I wanted to bring it to my college dorm, and once I was making other quilts that had time constraints too, there just wasn't enough time. I quilted in a very random pattern. You can see some of that in the above and below pictures. So, there is it. 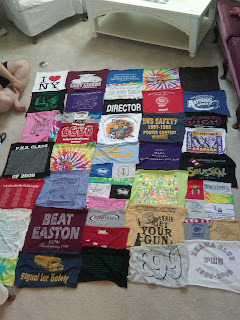 My quilt. :) I'm very happy with it. I probably won't even finish it/change it. Ever. I love it. You can win three dies and the Accu Quilt Go Cutter here, woo! The AccuQuilt Go Cutter is pretty much the new toy (and lifesaver) for quilters, for anyone who doesn't know. It's expensive though, and so are the dies (the patterns that cut your fabric). But there's tons of giveaways around for them! There's one here at Millie's Quilting, where you can win 3 dies AND the Go Cutter itself! I figured I should start posting about the quilts I made. I'll tell a short story about each one, and describe how I came up with the idea, etc. I'll start with my most recent quilt, finished in August, 2010. I made "Beach Babes" for Kristina, one of my best friends. I wanted to create something for her that was the opposite of traditional. It had to be colorful. It had to be challenging. It was. Kristina loves the beach, and we went there twice this summer. She also went to Greece and Aruba this summer, so I figured this design was very fitting. I wish I had learned the "wedding ring" quilt style before this - I just "winged" it. But, I think it still turned out pretty good =P I'm very proud of it. For a while, I just had the sunset and beach piece - it took a long time to get that together. Then, I sewed the three layer parts around it. I love the colors on the quilt, if I may say so myself. I wanted to keep it (actually, every quilt I have made so far, I have wanted to keep!) - but I refrain. At least I get to see it when I go over to her dorm room :) Well, and obviously I get to see HER, so that is okay, too. There's a giveaway over at Cut to Pieces to get Cherri House's "City Quilts" book! It looks so interesting - a modern take on quilts. If you're a quilter, go enter! 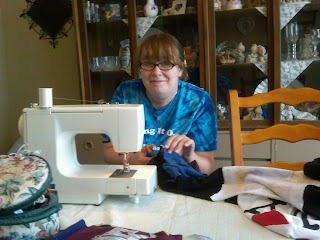 Hi, my name is Jess, and I'm a quilter. I'm learning. I have perfecting to do. I also have a list of about twenty-five things that I would love to make right now, and will in the next couple of years. I also LOVE fabric and reading quilting blogs. I unfortunately cannot sew or quilt at the moment because I am away at college, in a very demanding and time-consuming teaching program, with two jobs, and no room in my tiny single room to keep a sewing machine or even to spread out a quilt. This is why, right now, quilting is my "guilty habit" - hence the name of this blog (plus, my fiance came up with it, and he's set on having me name my blog and one day [hopefully] my business after this =P ). But quilting brings me so much peace and joy that I could never think of my "quilty habit" as a negative thing, and you shouldn't either! That is why I'm clearing it up now, in my first post :) For now, I'm going to start posting pictures of the quilts I have done so far, and blogging about give-aways so my poor college self might be able to win some gorgeous fabric and supplies from the amazing quilting bloggers out there! Hi! Welcome to my corner of the internet since 2010. Quite simply, I love to quilt. Take a look around and then you - yes, you - go sew something today! Aura Blog Party: Pollen Pillow Fight! Social media buttons courtesy of the c.w. frosting design.lab. Copyright Jessica Skultety, quiltyhabit.com, 2017. Simple theme. Powered by Blogger.